Spend analysis has gradually become the top process in the procurement executive’s toolbox, placing itself in the top tier of functionalities alongside e-sourcing, e-procurement and strategic sourcing solutions. 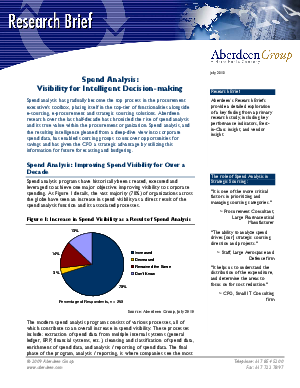 Recent Aberdeen research has discovered that in selecting a spend analysis solution, companies are focused on integration of the procurement and sourcing processes with an automated spend analysis system. This Research Brief provides a number of informative charts and graphs that cover topics from who is using Spend Analysis to how companies are implementing Spend Analysis Automation and Integration.